Laminating is one tedious process thank goodness it's finished. Now I have to cut the laminates to length. So in goes the mid keel section, same height above the hull at both ends. Now I trim the end of the mid keel square to the laminated keel. 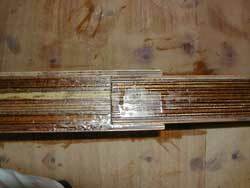 Then I cut through the laminated keel, remove the attached section and clean up the hull. 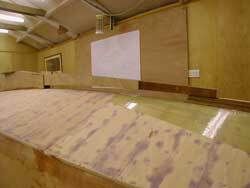 Due to the length of time this process has taken some of the glue from the parcel tape has remained on the hull and will have to be cleaned off. Here's a dry fit of the mid and forward keel sections now trimmed to fit. 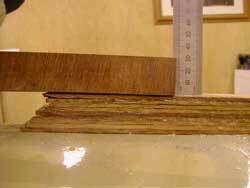 The mid keel still has some work to be done on it before it can be bonded in place. The sides need fairing and there a lot of cured epoxy to clean off. 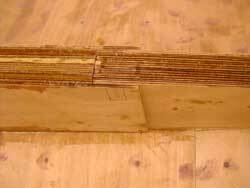 Now the forward section is laminated I'll concentrate next on finishing the mid section and getting this bonded on. This is the rear to mid keel joint detail. 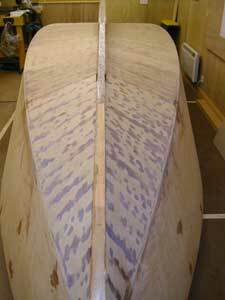 There is another 6mm ply skin to be bonded onto the mid keel to complete this detail.